L’histoire du chemin de l’exil du dalaï-lama. Au moment d’aborder un sujet sur le Tibet, la même question, depuis cinquante ans, revient : de quel Tibet parle-t-on ? Invité Olivier Weber, écrivain et grand reporter, auteur du livre Le Tibet est-il une cause perdue ? De quel Tibet parle-t-on ? Celui que représentent les Tibétains en exil, réfugiés et installés dans le nord-ouest de l’Inde ? Le Tibet définit dans le cadre de la République populaire de Chine ? Le Tibet comme entité géographique ? Comme espace culturel, étendue d’une civilisation ? Le Tibet espéré par les Tibétains ou le Tibet menacé par la mainmise chinoise ? Ce flou autour du Tibet a une date de naissance : le 17 mars 1959. Ce jour-là, Tenzin Gyatso, le quatorzième dalaï-lama, chef spirituel et temporel du Tibet, territoire sous contrôle de la Chine communiste depuis neuf ans, prend la décision de fuir son palais de Lhassa, la capitale, pour rejoindre l’Inde. Une longue marche vers l’exil, qui, derrière cette figure tutélaire incarne celui de tout un peuple. Quels sont les événements qui ont conduit à cette fuite ? Comment s’est déroulée cette longue marche ? Derrière l’image de compassion et de paix qu’incarnent les vertus bouddhiques, comment s’est organisée la lutte pour l’indépendance du Tibet ? De quelle manière le dalaï-lama s’est-il retrouvé confronté à ses devoirs de chef spirituel et de chef d’État ? Enfin, comment, ces quelques jours de 1959, ont fait basculé le Tibet dans une situation toujours d’actualité ? At about 1800 hours, Lobsang [one word missing, probably, Lobsang Samten, brother of…] of the Dalai Lama, reached Chuthangmu and was [one word missing]. The Union Government is thinking of relaxing the Protected Area Permit (PAP) scheme to enable foreign tourists visit border areas. This is half good news. Why half? Simply because after the Government starts to ‘think’, results often takes months or years to materialise. Let us hope that it will be done soon. Apparently, the move was triggered by requests from border States of Arunachal Pradesh, Himachal Pradesh, Sikkim, Uttarakhand, Nagaland and Manipur as well as the Union Tourism Ministry. It was announced by Minister of State for Home Kiren Rijiju, who, as an elected Lok Sabha member from Arunachal Pradesh, has long been aware of the issue. Under the Foreigners (Protected Areas) Order, 1958, all areas falling between the ‘Inner line’ and the International Border of the state are considered to be a ‘Protected Area’. Responding to a tweet by Pema Khandu, Chief Minister of Arunachal Pradesh, Rijiju announced the decision about the PAP regime which will allow foreigners to visit the ‘paradise on earth’; he was referring to Shungetser lake north of Tawang, often known as ‘Madhuri Lake’, because the Bollywood actress shot Koyla, also staring Shah Rukh Khan, in the ‘idyllic’ spot. It is a pity that the Government could not, at the same time, do away with the ‘Inner line’ permit system (for Indian nationals) once and for all. At a time when Artificial Intelligence (AI) has started permeating our lives, the Government is still attached to this 19th century-old scheme which has no place in a modern state. If required, the authorities could find other ‘electronic’ means to control visitors in the Indian frontiers. Hopefully, this would be the next bold decision. ‘Relaxing’ the PAP is nonetheless good for India; after all, these areas are part of the Indian territory and there is no reason why a discriminating ‘Philosophy of North-East Frontier Agency’ put in place by Nehru and his ‘tribal’ advisor Verrier Edwin, should remain in existence. During the 20th century, it has not often protected the local population, while more often alienated them from the main stream of Indian society. It is also a positive development because happenings on the other side of the border show extremely worrying trends. China is fast developing its frontiers, trying to woo the Tibetan locals, often akin to the Indian populations on the other side of the border. A few weeks ago, The Tibet Dailyasserted, “making the border villages prosperous and well-off is the top priority of the poverty alleviation campaign.” Beijing has, however, a second objective that is to build-up the border defenses against India. With tourism, it plans to kill two birds in one go. 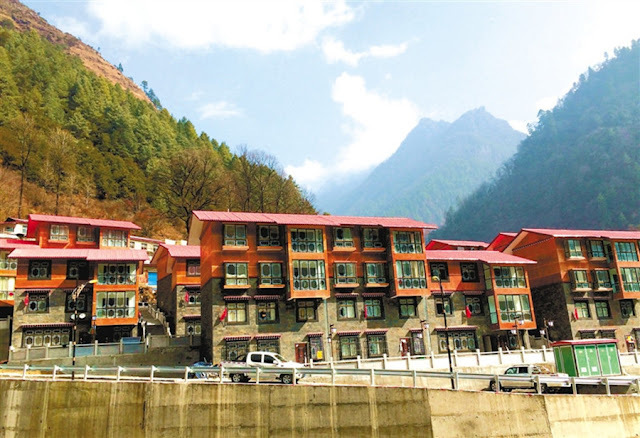 During the recently-concluded National People’s Congress (NPC), Phurbu Dhondup, a deputy and Governor of Lhoka affirmed that there were 96 such border villages in Lhoka Prefecture alone; the prefecture is north of Bhutan and Tawang district. Dhondup asserted that the Provinces of Hunan, Hubei and Anhui would help Lhoka “make the dramatic transition” from poor border villages to prosperous ones with electricity, first rate access roads, irrigation systems and potable water. The participation of the ‘rich’ Provinces of China in the scheme is an important factor. Out of the 17-member Tibetan delegation at the NPC, four members were from the borders with India. One Kesang Dikyi, who comes from Metok, north of Tuting sector of Arunachal, which recently witnessed a border intrusion (with Chinese excavators), is a primary school teacher. During a Press conference in Beijing, she remarked: “Our school building was very poor; teachers and students had to pick grass to cover the roof. The grass was taller than we were, so when we were walking back we’d often trip, and we often had our hands cut. If we didn’t pick the grass, rainwater would leak into the classroom.” All this has changed in the recent past. 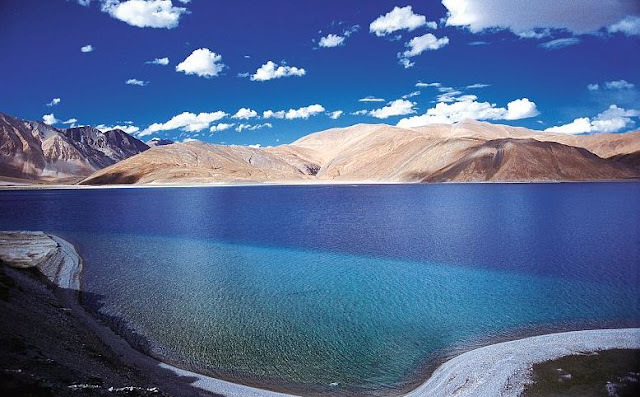 This includes the border villages north of Arunachal Pradesh, Sikkim, Uttarakhand and Ladakh. In 2018, the region will launch projects to make 13 townships and more than 1,000 villages connected by asphalt or cement roads; in other words, ‘an integrated transportation system’ reaching the border with India. For Beijing, tourism is the best way to tackle poverty …and to protect its borders (by buying the local population on China’s side). A turning point was Yume. In October 2017, President Xi wrote a letter to two young Tibetans who had introduced to the Chinese President, Yume, their hamlet located north of the McMahon Line (Upper Subansiri district of Arunachal Pradesh). The China Daily noted another development north of Arunachal: “After getting access to electricity and the construction of new roads, tea farmers and herdsmen in a village some 200 kilometers southwest of Lhasa in Tsona county founded a cooperative that provides skills training and job opportunities for villagers.” Tsona, an area now extensively developed, is the first small town in Tibet, north of Tawang district of Arunachal. At the end of the NPC’s sessions, Beijing announced the complete withdrawal of “civilian-oriented, firefighting and frontier defence troops” from the control of the People’s Liberation Army. What does it mean? The Global Times explained: “The withdrawal of armed police force units engaged in civilian affairs would disentangle the previous complicated chain of command.” It signifies that the PLA will only be given the responsibility of manning the border with India, without having to waste time in ‘fire-fighting’ and other tasks. The former militia and ‘frontier forces’ will be put under the command of the local party bosses, in a way empowering the local population to man the borders. With all these happenings on the other side of the India’s northern border, it was high time that India starts promoting border tourism, including for foreigners, and develops these areas, while keeping the environment as idyllic as possible. There is no harm in copying China once in a while. A quick review at the Chinese press related to Tibet during the last few weeks shows an extremely worrying trend for India. While the Indian media has been concentrating on Doklam, the happenings on the other side of the border, especially north of Arunachal Pradesh are disturbing. China’s second objective is to build-up the border defenses. It says that some 628 border villages needed to be turned into prosperous and well off administrative villages. But let us go through some of the articles/comments. 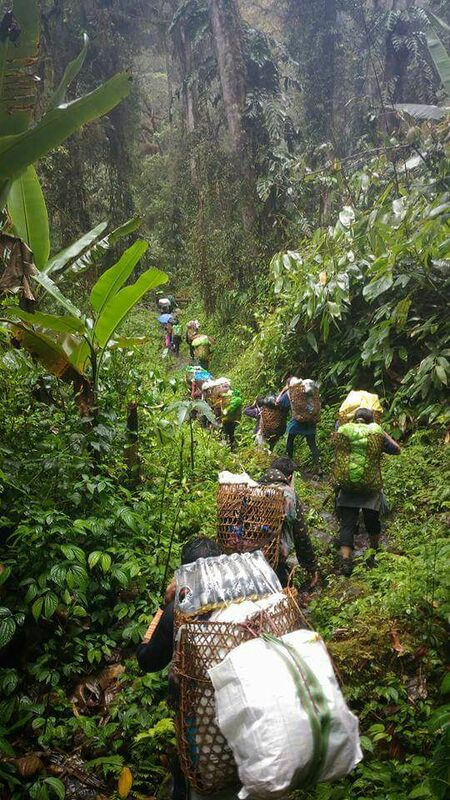 During the recently-concluded National People’s Congress (NPC), Phurbu Dhondup, a deputy and Governor of Lhoka, said there were 96 such border villages in Lhoka Prefecture alone. He asserted that the provinces of Hunan, Hubei and Anhui would help Lhoka “make the dramatic transition » from poor border villages to prosperous ones with electricity, first rate access roads, irrigation systems and potable water. The participation of the ‘rich’ provinces of China in the scheme is to be noted. As earlier mentioned in this blog, Drokar (alias Choekar) has been in the news. 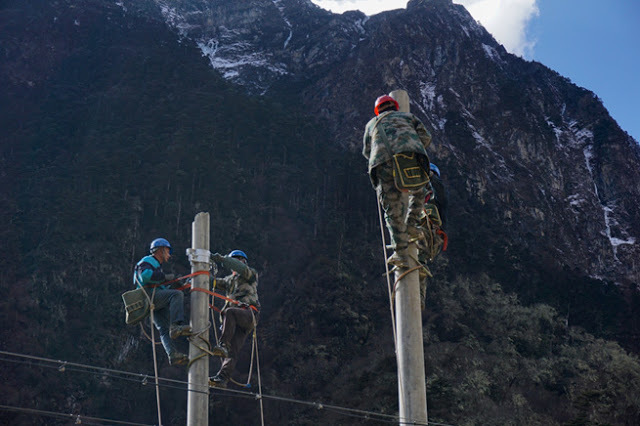 Mi-ma Guo-ji, (his Tibetan name is not clear), a young man who builds electricity transmission lines to villages. Kesang Dikyi who comes from Metok, north of Tuting sector of Arunachal, which recently witnessed a border intrusion (with Chinese excavators). She is a primary school teacher in a village near Metok. The CPPCC’s TAR delegation has a member from the border area, a Loba lady from Tsari village, east of Yume. Let us remember that the Tsari chu (river) enters India south of Migyitun which saw the first border incident between India and China in August 1959 (Longju). On March 4, Xinhua announces ‘Highways to reach all townships in Tibet by 2020’. This includes the border villages, north of Arunachal, Sikkim, Uttarakhand and Ladakh. In 2018, the region will launch projects to make 13 townships and more than 1,000 villages connected by asphalt or cement roads. Rural road mileage in Tibet is currently 60,421 km, compared with 53,244 km in 2012. In other words, ‘an integrated transportation system’. The objective is dual, poverty alleviation and ‘protection’ of the border. 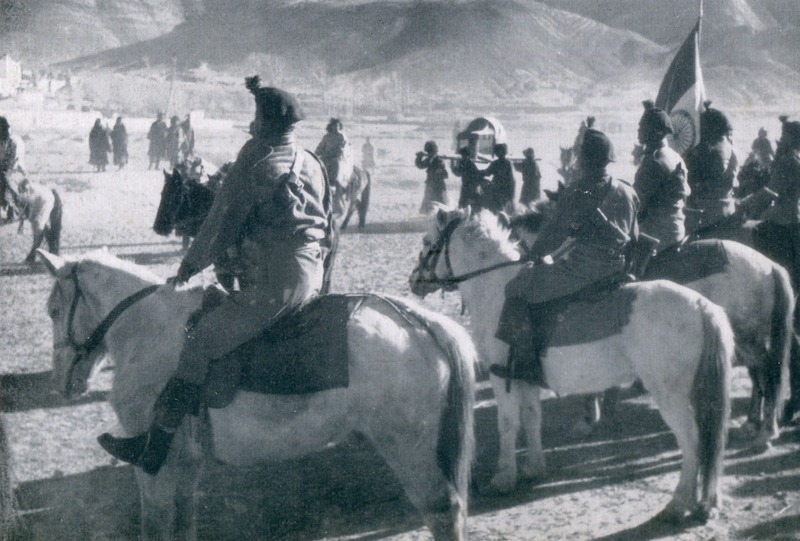 When the People’s Liberation Army (PLA) entered Lhasa in September 1951, General Zhang Jingwu, the representative of the CPC’s Central Committee told Sumul Sinha, the head of the Indian Mission in Lhasa that the Chinese had come to Tibet for two reasons only (he spoke of ‘a dual mission’): to eliminate all imperialist influences and to improve the standard of living of the Tibetans. Of course, there was no ‘imperialist influence’ on the Roof of the World, but poverty was there. What is surprising is that, 66 years later, the Chinese government still speaks about fighting poverty on the Tibetan plateau. It means a colossal failure for the Communist State. The new Helmsman wants to rectify this. For Beijing, tourism is perhaps the best way to alleviate poverty …and to protect the border (by buying the local population on China’s side). And provinces have been called to the rescue to ‘invest’. It is worrying, because there is no doubt that each investor will want a ‘return’. What does it mean for Tibet is difficult to predict. The repetition of the word ‘stability’ while speaking of the region, probably means that presently the TAR is not too ‘stable’. By bringing millions of tourists who will bring good revenue to the local population. How to stabilize the borders? It says that the construction of the Chamdo-Bamda Airport section of the National Highway 214, linking Tibet’s highest-altitude airport at an elevation of 4,334 meters to Chamdo city has started. 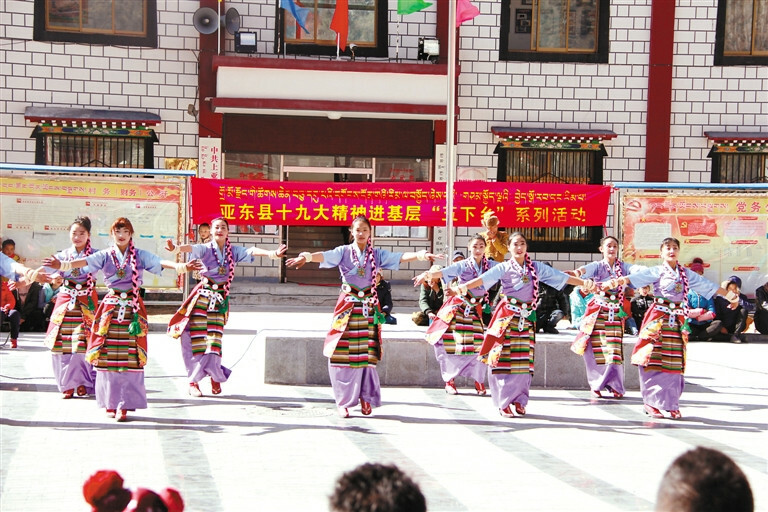 It will greatly help to develop tourism in Eastern Tibet. 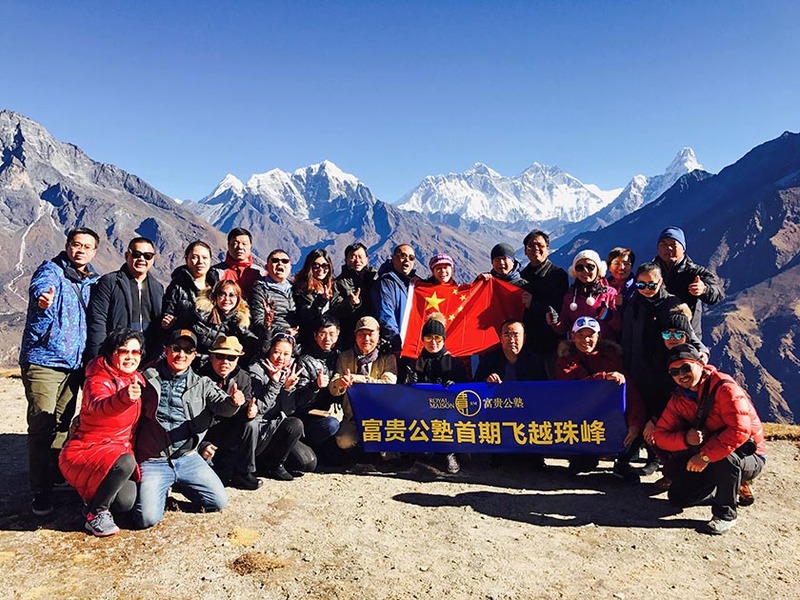 Another site, China Tibet Online notes that ‘Tibet on fast track to facilitate travelers’. According to Wang Songping, head of the Tourism Development Committee of Tibet: “The increasingly improved transportation infrastructure has allowed travelers to spend less time on road as they tour in Tibet. Wang said that highways, railways and airports have improved continuously to facilitate travelers’ trips and meet their need to move fast on their way to scenic spots. 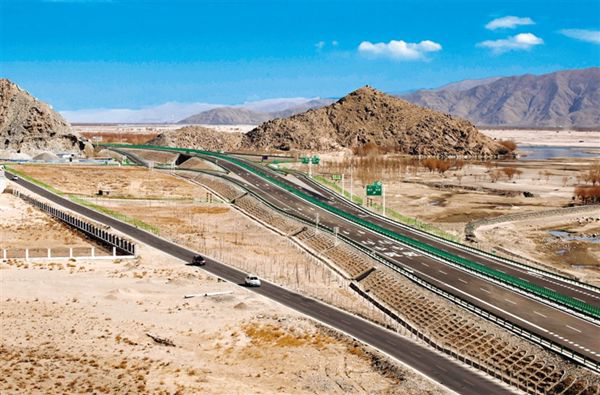 With most part of the Lhasa-Nyingchi Highway opened to traffic, “it will be more convenient for travelers to pay a visit to Nyingchi,” noted Wang. All this infrastructure being built for ‘dual use’ (civil and military), means that ultimately, it will bring more pressure on the Indian border. The season has been extended and winter is promoted as the best season to visit the Roof of the World. Note the Land of Snows, is always called ‘China’s Tibet’. Would we write in India, ‘India’s Tamil Nadu or India’s Arunachal’? Does it mean that China is not sure if Tibet is China’s? Beijing seems to have a serious problem here. Other pictures show a Park in Lhasa, capital of China’s Tibet, “after the strongest snowfall since last year’s winter arrives in the evening of March 17, 2018;” another illustration pictures a child is playing in the snow. 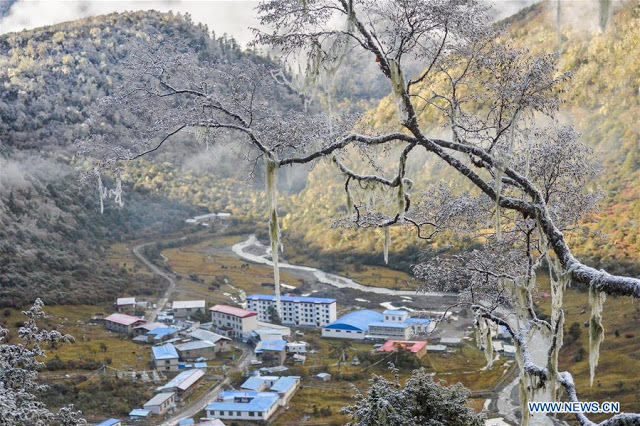 I often wrote about Yume, the hamlet north of the McMahon (Upper Subansiri district of Arunachal Pradesh). In October 2017, Chairman Xi Jinping had written a letter to two young Tibetan herders who had introduced their village to the Chinese President. A letter from the Emperor always shows the trend in the Kingdom. 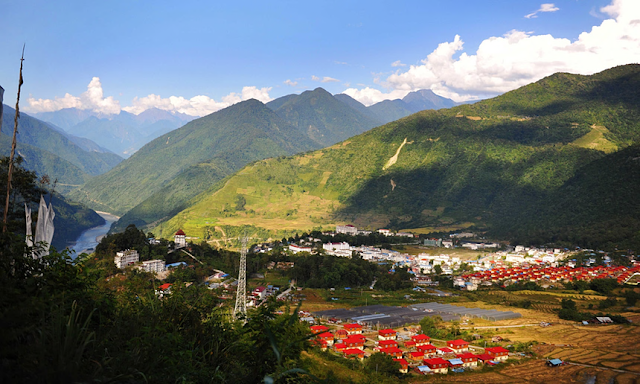 Tsona is located north of Tawang district of Arunachal. The area has been extensively developed. In November 2016, I wrote The Chinese tourists arrive on the Indian border. It was about the village between Tsona and the Indian border. 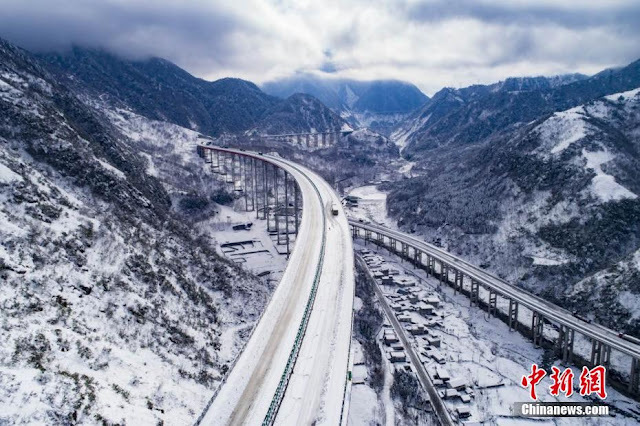 The China Daily estimated that the road access rate in the area will reach 100 percent and the per capita disposable income will double by the year of 2020. 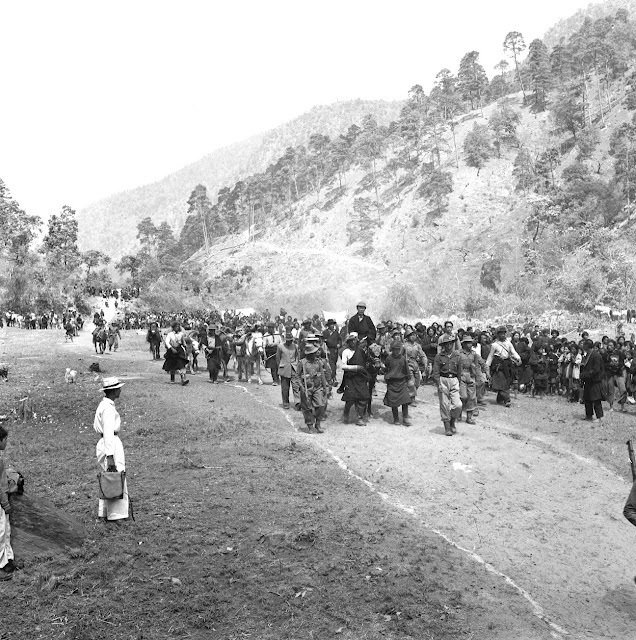 Tsona is also been linked with Tsangyang Gyaltso, the Sixth Dalai Lama born in Urgyeling, near Tawang. He would have stayed in Tsona on his way to Lhasa to be enthroned. 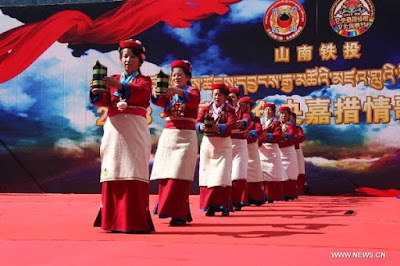 Every year, a Tsangyang Gyaltso Festival is being organized by the Communist authorities, who, when it is convenient, promote the Dalai Lamas. On February 28, VTIBET.com mentions that “Dromo County held sending culture and art to villagers activities”. Though the title is not very clear, Dromo is the Tibetan name for the Chumbi Valley, east of Sikkim. Probably due the vicinity of Dolkam, the activities were not only ‘cultural’, a photo showed officers from People’s Court of Dromo County handing out ‘basic legal knowledge’ leaflets to villagers. What were these ‘legal leaflets’ about is not clear? That the entire Chumbi Valley belongs to China? Nothing has been published in the railway line to Yatung in Chumbi Valley recently. China is keeping quiet about it, since the Doklam episode. Further, it is said that 12 new tourism projects were built in Ngari last year, with a total investment of about 11,62 million yuan, and a total of 96.6 million yuan budget was approved by the central government to invest 6 key tourism projects that were declared to the 13th Five-Year Plan. The quick development of tourism in Western Tibet is bound to bring more pressure on the Indian border in Uttarakhand and Ladakh. Zhang, a senior researcher at the Institute of High Energy Physics in the Chinese Academy of Sciences (CAS) observed that the project will start operations in 2020 and observation results will be available in 2022. On March 22, according to The Global Times, China’s Tibet “vows to control the number of visitors in the region’s scenic spots, including Mount Chomolangma, known as Mount Everest in the West. 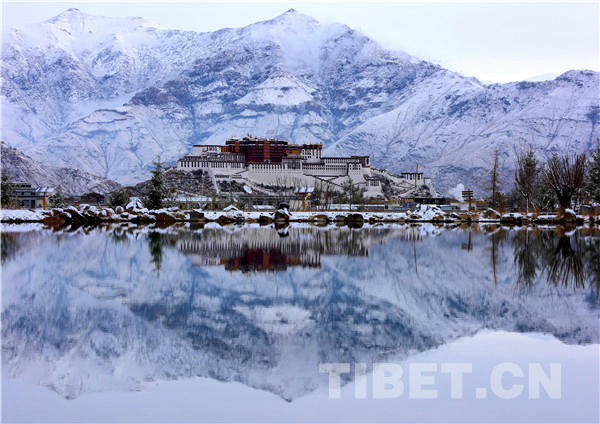 With the winter tourism promotion scheme offers free admission to 115 major tourist attractions in the region, including the Potala Palace, from February 1 to April 30, plus discounted fares for hotels, local transport, flights and train services. In Tibet, China is pursuing a dual policy to tackle ‘poverty alleviation’ and ‘protect’ its borders (with India). Tourism is used in the grand scale to achieve these two objectives. The support of the ‘rich’ provinces of China is also asked for. To develop the borders means to ‘stabilize’ the borders. By ‘stabilizing’ the border areas, Beijing protects its borders. Extensive ‘dual use’ (civil and military) infrastructure is built for the purpose. This creates a worrying scenario for India. 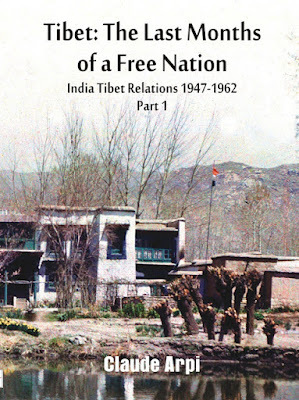 A review of my book Tibet: The Last Months of a Free Nation, India -Tibet Relations 1947-1962, Part 1appeared in The Hindustan Times. The review, titled The Last Days of Tibet (Two very different accounts of the end of an era make for fascinating reading), has been written by Thubten Samphel, the Director of the Tibet Policy Institute in Dharamsala. The reviewer looks also at another book, Tibetan Caravans: Journeys from Leh to Lhasa, Abdul Wahid Radhu, Speaking Tiger publishers. Incidentally, a few years ago, I wrote a chapter of a book on Abdul Wahid. Claude Arpi’s book and Abdul Wahid Radhu’s work share a common thread — both are accounts of the last days of Tibet. While Arpi digs into the archives of the government of India to reconstruct the period, Radhu has witnessed the end of an era. Arpi’s narrative reveals newly-independent India grappling with a deep diplomatic dilemma. Three years after India gained independence, Tibet lost hers. Indian policy-makers were divided into two camps on how to tackle the situation. The idealists, dominated by Jawaharlal Nehru, India’s charismatic first prime minister, felt that accepting the fait accompli of Chinese occupation of Tibet was a small price to pay for a resurgent and united Asia after centuries of Western colonialism. The realists, led by Sardar Vallabhbhai Patel, India’s deputy prime minister, argued that communist China was not working towards a resurgent, united Asia but towards an Asia dominated by a new China. Beijing’s invasion and occupation of Tibet was the first step towards fulfilling its expansionist goal. Arpi has comprehensively documented this debate on China’s true intentions. Using the archives at the Nehru Memorial Museum and Library, he has pieced together India’s contradictory impulses in meeting China’s challenge in Tibet. On the one hand, India had deep sympathy for Tibet based on the ancient bonds of culture and a shared spiritual heritage. On the other, there was the sinking recognition that this sympathy could not be translated into military and political support because the changed geopolitical balance favoured China due to its military presence on the plateau. Finely researched and passionately told, Claude Arpi’s new offering is the first detailed account of the internal policy debate that raged at the highest level of the new republic on formulating the most effective response to the occupation of Tibet. With the death of Sardar Patel, the idealists won the argument and Tibet’s fate was sealed when India signed the Panchsheel agreement with China, which recognized Tibet as an autonomous part of the People’s Republic. India’s feeble response to Beijing’s occupation of Tibet was compounded by the mistakes Tibet made. Arpi recounts that instead of seeking cooperation and support from the new Indian republic, the Lhasa government in its first official communication with independent India demanded the return of Tawang. In his interview with Arpi, the Dalai Lama exclaimed in amazement,“What a wonderful government!” at Lhasa’s diplomatic ineptitude and ignorance of obligations imposed by treaties. The issues that Arpi has explored in his massive book are ones that India will continue to grapple with in the years to come as New Delhi fine-tunes its policy towards China, that reaps the benefits of expanding trade but confronts Beijing’s political and military assertiveness. If Tibet was isolated diplomatically, its engagement with its neighbours was active, robust and profitable. This was made so by a network of caravan trails that carried goods over vast distances infested by marauding brigands. One of these caravan routes was the one from Leh to Lhasa, a tributary of the ancient Silk Road that connected China with High Asia, Central Asia, and the West. This culture of caravanserai that radiated throughout Asia is wonderfully evoked in Tibetan Caravans, a leisurely travelogue rich in detail and sharp in observation. The travel diary was kept by the late Abdul Wahid Radhu, a cosmopolitan Ladakhi Muslim, a graduate of Aligarh University and who, in the course of his life, travelled to Tibet, China and all over northern India. 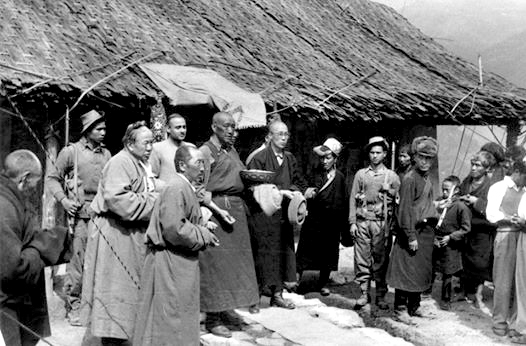 Radhu made his first caravan journey to Lhasa in 1942 when World War II engulfed Europe and the civil war in China between the Nationalist Chinese and communists was tilting in favour of Mao’s forces. Those forces would soon be in Tibet, disrupting the Radhu family’s profitable trade and with Abdul Wahid himself being caught up in the last ditch effort to salvage whatever was left of political Tibet. Radhu begins his diary 76 years ago. “Today, 19 September 1942, the twentieth day of my life as a married man, I left my family, my wife, my aunt and sister. I left for Lhasa to learn the trade of being a merchant, supervised by my Uncle Abdul Aziz, head of the Lopchak caravan.” This was a part of the exchange of trade and courtesies between Leh and Lhasa. 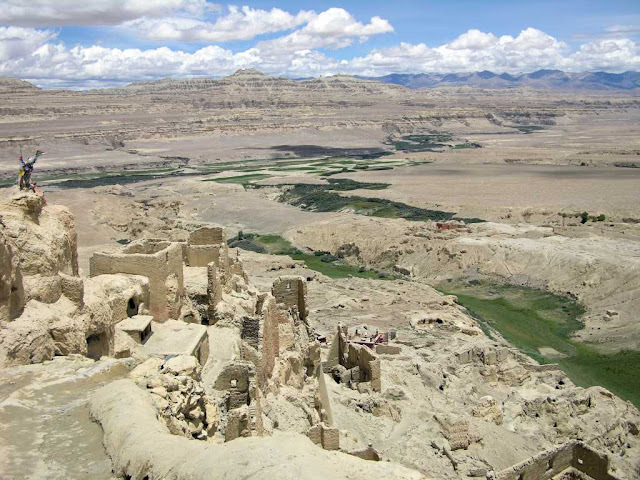 Radhu is a nostalgic witness to the end of two eras: the way of life of the caravaneers and the demise of political Tibet. Xi Jinping made it. He can now retain his seat for life. The Hong Kong newspaper said that Xi, who had maintained a poker face throughout the opening day of People’s National Congress (NPC), appeared ‘much more at ease after the vote’. Only two of the 2,964 deputies voted against the constitutional revisions; the process was over in just one hour: no debate took place, no discussion and not even canvassing. Done! While the international press mainly noted the Emperor-for-life aspect, there is more to the recent amendments of the Chinese Constitution. The China Daily titled: ‘Xi leading the charge on reform’. Perhaps more than a personal determination to emulate Mao, Xi seems to want to transform China into a great power; he calls it the ‘Chinese Dream’. Will Xi leave place for others to exist in the process is a recurrent question. 2018, which marks the 40th anniversary of Deng Xiaoping’s opening-up policy, will see a string of changes which should take China closer to ‘a moderately prosperous society in all respects’. Xi pledged to continue deepening reform with ‘great political courage’; to move forward, the Chinese people were ready to ‘cut paths through mountains, and build bridges across rivers’, he said. A day after Xi’s ‘promotion’, more than two dozen ministries and agencies were overhauled to give the Communist Party greater control …and more teeth. It includes the merger of the banking and insurance regulators, a special ministry to oversee the status of military veterans and a new Discipline Commission with larger powers to tackle rampant corruption. The nomination of a Vice-president, Xi’s friend and close collaborator, Wang Qishan, is another sign of change. Another aspect of the reform is the development of China’s land borders (with India in particular). Not only will the military-civilian integration translate into new infrastructure on India’s northern borders, but the development will be labeled ‘infrastructure for tourism’, while being used by the PLA to reinforce its position. A ‘democratic’ touch is being given to the process. Soon after the conclusion of the 19th Congress in November last year, President Xi Jinping sent an answer to two young Tibetan herders who had written to him introducing their village, Yume, north of Upper Subansiri district of Arunachal Pradesh. Drolkar and Yangzom, the two sisters, had told Xi about their experience of living in a border area; their village, Yume is not far from the remote Indian village of Takshing. A letter from the Emperor was enough for Drolkar to get a seat as a NPC deputy. Drolkar’s sudden celebrity has helped her village to grow exponentially; many Tibetans from the nearby villages now want to move their homes to Yume. Villagers are building new guest accommodations to receive Han tourists, who have started pouring in. As a result the village will become wealthier …and the border more stable. That is precisely the Emperor’s plan. Another deputy to the NPC, Kelsang Dekyi comes from Metok, north of Tuting sector of Arunachal, which recently witnessed a border intrusion (with Chinese excavators). These two appointments show the importance that Xi attaches to the border with India. Statistics show the 75% of the NPC’s deputies are new faces, with similar stories. Will it help China to build a better China? It is not certain, because many of these nominations are just for the show. Incidentally, would a local girl from Takshing village on the Indian side of the border, write a letter to Delhi? One can bet that it would go unnoticed by the authorities; it may not even be delivered. Still India is a democratic nation.